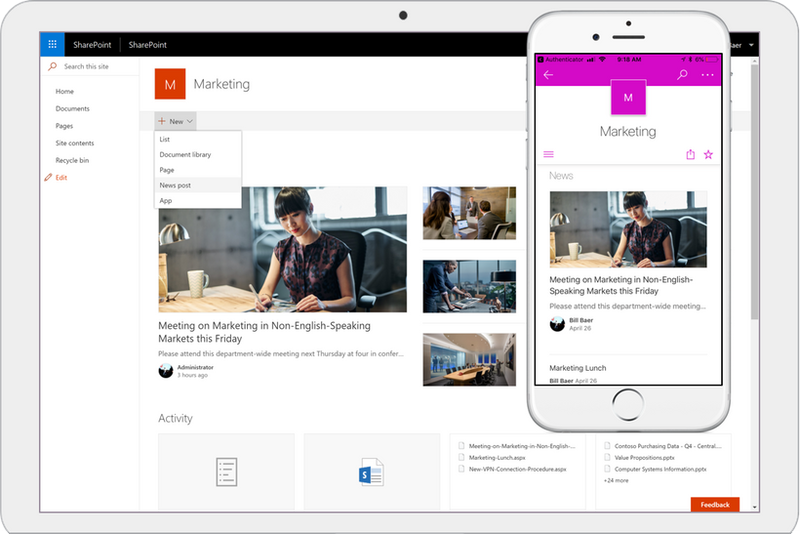 Microsoft took a cue from the car manufacturers and released SharePoint Server 2019 in the fall of 2018. First announced for general availability at Microsoft Ignite, the SharePoint Server 2019 release was built on the same core platform as SharePoint Server 2016 while also incorporating many of the newest modern SharePoint Online features found in the cloud-based version of SharePoint. The release provides businesses with both compatibility for their existing installs and a path to using newer tools and features. There are plenty of new features and tools in SharePoint Server 2019. One of them that doesn’t generate a lot of buzz is actually the answer to an all too common issue with SharePoint. The Modern Experience updates not only improve the look and feel of SharePoint sites, lists and pages, it finally makes them mobile friendly on a cross-platform basis. At long last, users can stop rotating their phones, and opening their fingers just to zoom in enough to get an accurate click on a page that has been sized down to fit the screen. 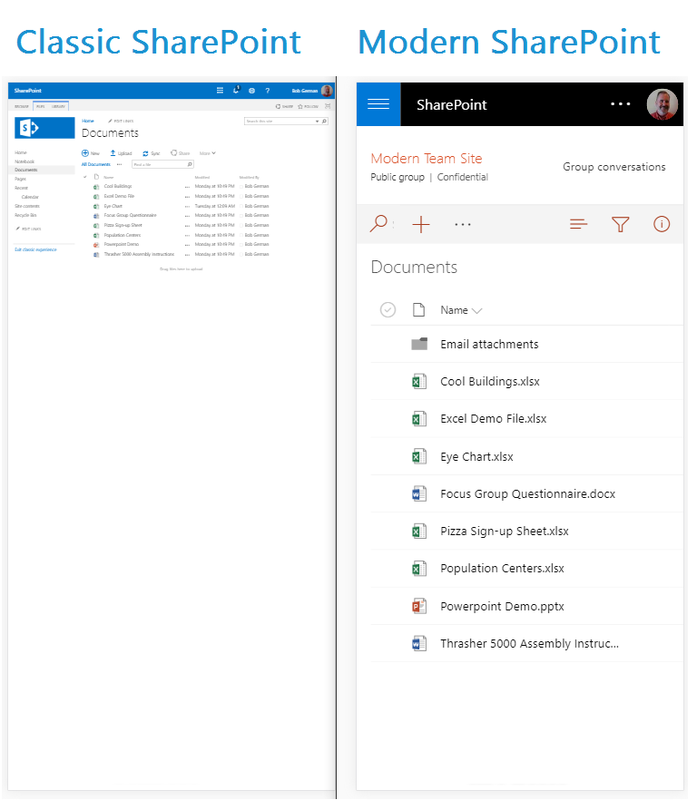 The SharePoint 2019 modern experience is mobile friendly and cross platform friendly. Another anticipated feature is the SharePoint home page. While it might not seem like much, the SharePoint home page makes it much easier to find SharePoint sites, pages, lists and teams. Say good-bye to that sticky note with the tree of clicks necessary to get down into the right collection and eventually the right sub-site. The modern experience homepage not only makes it easy to find sites users are looking for, but even will publish news from sites users are following. If enabled, new sites can be created directly from the home page. Along with the easier to navigate home page comes an improved search function, including search suggestions that appear as you begin typing, so that the first few words can get you where you are going. It’s also smart enough to only show things you have access to, and not to show hidden, offline, or otherwise inaccessible results. All this means SharePoint 2019 goes even further toward living up to its promise of letting everyone find and access everything, everywhere. 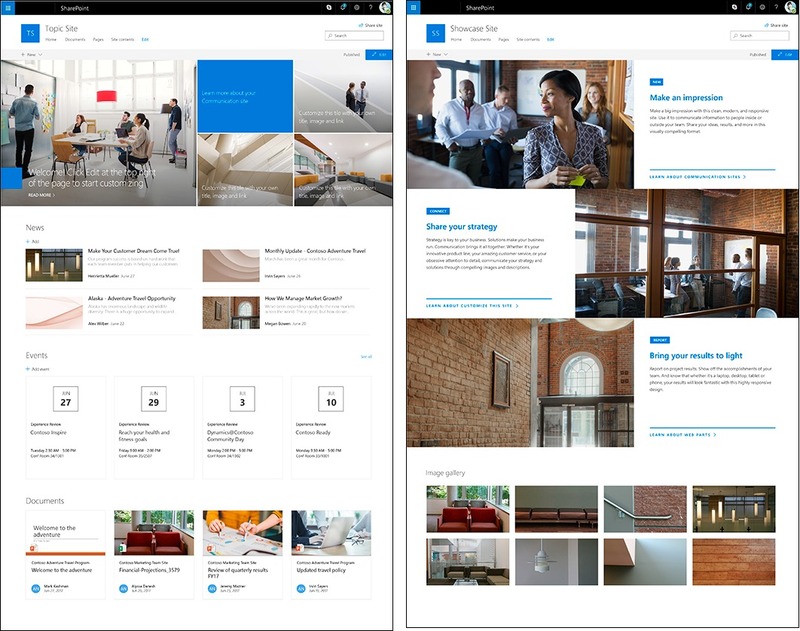 New SharePoint Communication Sites, coupled with modern pages, are another eagerly awaited feature. While SharePoint 2016 offered more flexibility than trying to get the intern to update an intranet webpage using HTML, or heaven forbid, Dreamweaver, it still relied on pre-created master pages or page layouts. The inevitable issue of what to do when information is not well conveyed in one of those pre-determined setups is solved by Communication Sites and modern pages. Modern Experience Communication Sites don’t require any sort of template, so if HR wants to post a picture of a flyer, or a scan of the employee handbook, or a carefully crafted new policy, they can create exactly what works best for the situation, all without ever having to submit a help desk ticket for a new format. While Modern Communication Sites provide a way to publish information out to the many, Modern Team Sites, along with Modern Libraries, allow for better collaboration within teams. The better looking, easier to use 2019 versions are actually usable without compromise on mobile devices. Meanwhile, Modern Libraries make it easier to find files and ensure that you are always working on the current version, even if someone else I working on it at the same time. Creating new documents from scratch is also more intuitive, functioning almost the same as in OneDrive instead of having to use the Ribbon. Files can also be added as links instead of as another copy. OneDrive Sync will finally eliminate chronic issues with synchronization. Search for SharePoint synchronization issues, and you’ll have plenty to choose from. SharePoint 2019 offers an updated OneDrive Sync client, optimistically called NGSC, or New Generation Sync Client. It allows SharePoint linked files and folders to exist on a local, or remote, drive without worrying about keeping them updated, and backed up. Microsoft proudly points out the new and improved client, showing that they took improving it seriously. That’s good news for all those administrators out there tired of getting support calls about syncing issues. In addition, new hybrid support allows business to do as much, or as little on-line, on-premises, or in the cloud as required. SharePoint Sever 2019 bridges the gap by making it seamless to the user whether they are accessing a file on their own hard drive, or miles away. Of course, no upgrade would be complete without some capacity bumps to keep up with an ever growing, ever faster world. SharePoint document libraries can now store files up to 15 GB, up from 10 GB in SharePoint 2016. Path limits also increased to 400 characters, up from 260 characters. Also, both # and % are now supported in file and folder names. Ready to Get Started with SharePoint Server 2019? 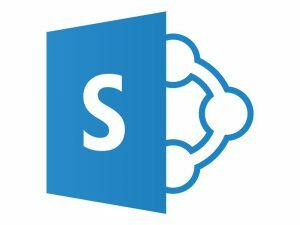 Microsoft SharePoint Server 2019 brings much needed improvements to the on-site SharePoint experience that will make it even easier and more powerful for your business. 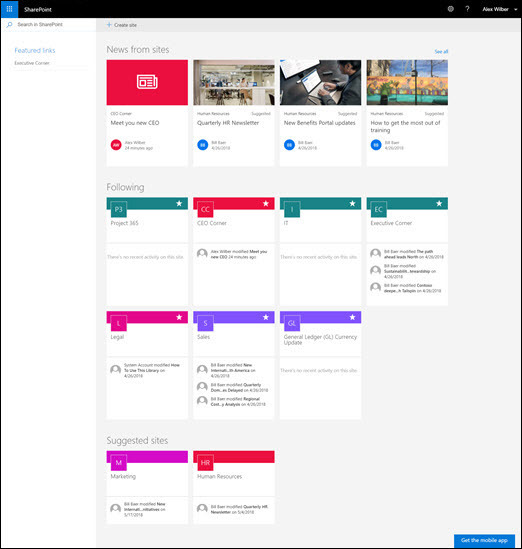 If you’re ready to get started with SharePoint 2019, you never want to do it alone. Having a certified SharePoint partner like Imaginet by your side who has “been there, done that” many times before can help ensure a smooth and successful transition to this newest platform. Our Imaginet SharePoint experts have helped over 500 customers around the globe with all of their SharePoint needs since the first version of SharePoint was release. And we’re ready to help you, too. Contact us today at info@imaginet.com or 1-800-989-7622 to schedule a free consultation call to get started on your path towards an improved modern collaboration experience with Microsoft SharePoint Server 2019.